Your kitten needs a special nutrition for healthy and happy development and you also want to make sure your kitten enjoys the meal. 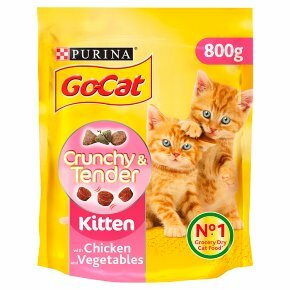 Go-Cat® Crunchy & Tender Kitten will give your kitten a great start in life. Go-Cat® Crunchy & Tender Kitten is a complete and balanced pet food specially formulated for the healthy development of your kitten. It offers two different textures for your kitten’s enjoyment at mealtimes. It contains: -Crunchy kibbles to help maintain healthy teeth and gums. -And some softer, more tender kibbles that provide extra nutrition to your kitten. They are richer in vitamin D, which helps build strong bones. Go-Cat® Crunchy & Tender Kitten provides your kitten with all the nutrients to ensure a good transition from mother’s milk to solid food. Give your kitten all the nutrition needed to surprise and delight your home every day! 100% complete & balanced. Specially formulated for kittens up to 1 year. Happy and healthy growth. Offers two different textures / Some softer, more tender kibbles. No added artificial colours, flavourings or preservatives. Kittens are natural explorers, alive to everything in their world. These young explorers need specific nutrition for happy, healthy development. And this new world of discovery continues at mealtimes with delicious food your kitten enjoys to eat. That's why Purina® Experts have created Go-Cat® Crunchy & Tender Kitten: a 100% complete and balanced, delicious kitten food made with two different textures to ensure mealtimes are part of your kitten's adventures. Healthy Teeth and gums: Crunchy Kibbles to help maintain healthy teeth and gums Strenghtens Natural Defences: Promoted by vitamin E Toned Muscles and strong bones: Quality protein source for muscle development, and Vitamin D which helps build strong bones Some softer, more tender kibbles for your kitten's enjoyment at mealtime Go-Cat® has been feeding cats with good, wholesome nutrition for decades. We fill millions of bowls and this honour comes with great responsibility. It's up to us to make sure all cats who eat delicious Go-Cat® get the healthy food they need? That's why Go-Cat® recipes are made with no added artificial colours, flavourings or preservatives. So you can keep feeding them the same tasty food they love and feel proud about it. Daily feeding (g/day) Quantity of provide - (g/d) - Dry alone 6-12 weeks - 25 - 85g 2-3 meals1 3-6 months - 50 - 110g 2 meals1 6-12 months - 100g-60g 2 meals1 Pregnant Cat - Min. 100 1 Nursing Cat - Min. 270 1 1or ad libitum. Feeding guide: Product should be mixed with water to make eating easier. Increases the quantity as the kitten starts to eat more and reduce the quantity of water added when kitten is able to eat the food alone. Each kitten is different, depending on the kitten activity level and body condition, food amounts and/or time allowed to eat may need to be adjusted. Also suitable for pregnant and nursing cats. Fresh, clean drinking water should always be available. Sufficient every day consumption of water is essential for the health of your kitten.